This instrument is unsigned, but research in the Medici archives has revealed that it was built by Bartolomeo Cristofori at the end of the 17th century for the Medici collection. 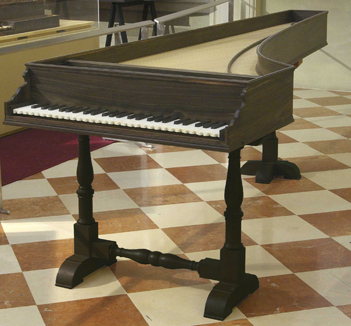 The Medici must have had a stock of precious materials such as the Macassar ebony that this harpsichord is made of, as well as ivory for the keyboard. The ebony is not pure black as African ebony, but has a beautiful range of grain colours. Even the jack guides, bridges and jacks are of ebony! The copy made by Kerstin Schwarz is based on research on the original, including the study of radiographs. We have a limited stock of this ebony to build some further copies.